A person's eyes are a beautiful aspect of the face that deserve to be seen, but sometimes an excess of skin on top or around the eyes can render an unflattering facial appearance. Huntington, NY plastic surgeons Drs. James Romanelli and John Layliev perform eyelid surgery (known as blepharoplasty) to lift and tighten the lower, upper, and/or all four eyelids, creating a younger and awakened facial appearance. 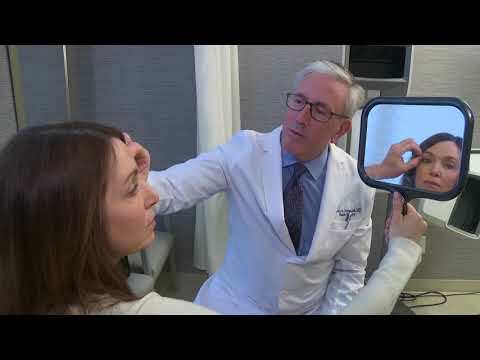 So many men and women have eyelid surgery at Romanelli Cosmetic Surgery on Long Island to correct sagging skin, which assists with both function and appearance. Whether upper, lower, or all four, eyelid surgery creates a softer, younger appearance and can produce subtle yet noticeable improvements. Contact our office in Huntington, NY to learn more. Blepharoplasty is a facial cosmetic enhancement that is popular among both men and women. During the initial consult, treatment options will be provided by our surgical team based on your condition that needs to be corrected. Most often, ideal candidates are impaired by excess, sagging skin and folds on the upper eyelid or puffy skin just under the bottom eyelid. These irregularities can cause function problems that can get in the way of everyday activities. For a more awake facial appearance, blepharoplasty may be the appropriate treatment for you. If you have excess, hanging skin on the upper eyelid or bulges and puffiness under the eyes, blepharoplasty can repair this to provide you with a softer appearance. "Eyelid Surgery - It is clear that patient care and a pleasant professional environment are top priority in this office. Every person that interacted with me was so polite and accommodating. The office was neat clean and very tasteful. Dr. Romanelli has an excellent reputation so there was no need to go elsewhere. I would highly recommend this office. I am excited to see the results." "Eyelid Surgery - Was treated by positive people"
"Eyelid Surgery - Friendly staff beautiful office short wait time"
"Eyelid Surgery - Dr.Rmanelli was such a nice dr and had such a nice bedside manner"
"Eyelid Surgery - I liked Dr. Romanelli's personality very much, looks you in the eye, seems to care to know you. The woman who discussed the financing was spectacular. She was helpful and understanding and I feel completely comfortable calling back to discuss how I can best schedule the procedures I want. I have been away since my visit and just returned. I will be calling this week to discuss further. The office experience was as nice as my friends have described it to be." During eyelid surgery, depending on the nature of the surgery, some form of anesthesia will be used. This cosmetic procedure may be done on the top eyelid by itself, on the bottom portion, or a blend of both treatments at once. Upper eyelid surgery assists in reducing the excess of skin that impairs vision and attains a more flattering look. the incision point is often placed along the natural crease to remove skin and tissue. Lower blepharoplasty is performed to improve bulging, bloated skin underneath the lower lid. In most cases, an incision is made below the lash line to surgically remove fat, and the skin is gently lifted to create a flatter, smoother look. Sometimes, a nonsurgical laser procedure may be performed to help with discoloration, while injectable fillers can be used for additional volume and smoothness if needed. Combines both the upper and lower blepharoplasty procedures. It will utilize the techniques describes above to create a younger-looking profile to the eyes. Specific details of this method can be discussed during your initial consultation, as it may not be right for everyone. Eyelid surgery can take up to two hours depending on whether both eyes, one, or all four are treated. After surgery, you should allow several days to rest. Cold compressions can assist in reducing swelling, bruising, and discomfort. The outcomes from eyelid surgery may last a decade or longer and even though the results are long lasting, aging does not stop. To continue to enhance the surgical outcomes, nonsurgical treatments at Romanelli Cosmetic Surgery such as injections, fillers, and lasers can be added to create a glowing appearance. If you have vision impairment due to excess skin protruding from the upper lid or suffer from bulging bags under your eyes, then cosmetic eyelid surgery at Romanelli Cosmetic Surgery may be the answer for you. This treatment can allow you to look and feel younger and more alert. We welcome you to call our office to make a consultation with one of our skilled plastic surgeons.